With another weekend, comes another slate of big SEC games. 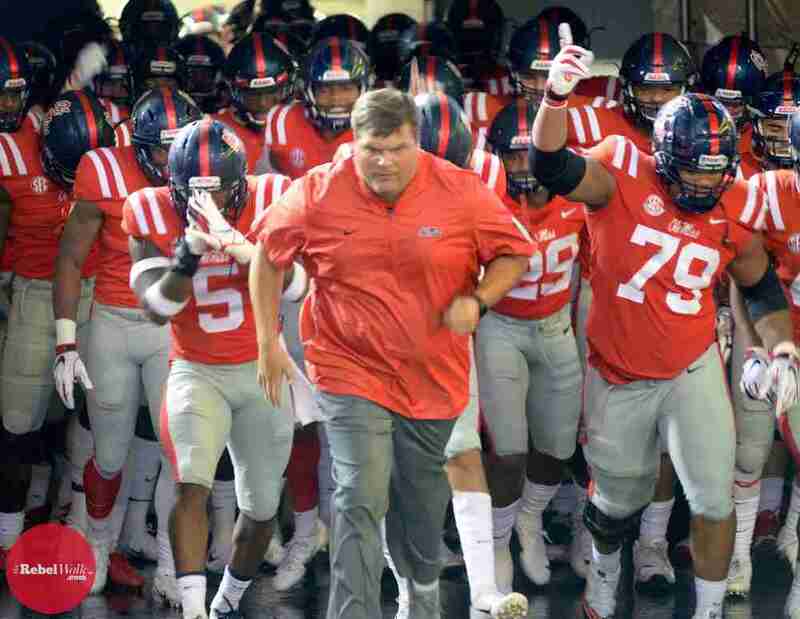 The Rebel Walk takes a look at the matchups around the SEC and makes our Week 8 picks. Last week, fans were treated to a great collection of SEC games. We saw blowouts, upsets, and shootouts. We saw teams rise up, and teams seemingly collapse. However, that’s just all part of the college football season, especially for teams in the toughest conference in the country. For Week 8, the tale will be no different, as SEC fans will have a whole Saturday’s worth of football entertainment with this schedule of matchups from around the SEC. Bye Weeks: No. 8 Georgia, No. 11 Florida, No. 17 Texas A&M, and South Carolina are all off this weekend. Here are our picks for each of this weekend’s upcoming SEC games. Take a look at what we think will happen this Saturday, give us your feedback on Twitter (@TheRebelWalk) and Facebook, and let’s talk SEC football! Hotty Toddy! Jake: Arkansas is better than the record shows, but Ty Storey is out. This game could get weird, but Arkansas should still pull it out at home. Evie: Arkansas QB Ty Storey will not play in this game following a concussion suffered against Ole Miss–but it shouldn’t matter as the Razorbacks will bounce back and win this one. Land: Arkansas should win this game… right? I think Morris’s Razorbacks bounce back from last week’s heartbreak and get a MUCH needed win in front of the home crowd. Hays: Arkansas will rebound after a tough loss against Ole Miss and bring it to the Golden Hurricane unit. The Razorbacks take control and do not let off the gas. Jake: UT turned a corner last week with a win at Auburn, and they do have The Tide at home at Neyland Stadium. Alabama is just on another level, though. The Tide will roll again. Evie: Alabama enters its 8th-straight game to start a season as a 20+ point favorite, an all-time Alabama record, and with good reason. Tide will continue to roll. Land: Alabama just looks unbeatable. Great win for the Vols last Saturday, but I don’t see them repeating last week’s result. Tide rolls on. Hays: A lot of hype swirls around for the third weekend in October, but the Tide is too powerful and will roll the Volunteers. Jake: This one will most likely be a gritty, high-scoring game. Wide open. Mizzou has lost 3 straight, Memphis will just outscore Mizzou in the end. Evie: Missouri has covered all three games at home this season (going 2-1 in those three), and Memphis has yet to cover on the road. It will be a closer game than 9.5, but Missouri will win in the end. Hays: Missouri has lost three games in a row, but they have been against tough SEC opponents, such as Alabama, Georgia, and South Carolina. These Tigers bounce back and blow the Memphis Tigers out. Evie: LSU is riding high at home, sitting at 4-0. I look for the Tiger defense to tame Fitzgerald and the MSU offense and avenge last year’s loss to the Bulldogs. And as for Death Valley…the Tigers don’t need artificial noisemakers. Land: LSU wearing some flashy new uniforms to celebrate its 125th anniversary… Look good, feel good, play good, right? I love it when LSU and Coach O lose, but I love it when State loses even more. Hays: LSU plays the Bulldogs in between Georgia and Alabama… Upset alert?? LSU manages to pull out a sloppy victory at night in Death Valley. Jake: Vandy has been good as of late, but Kentucky has looked better. With UK’s Bennie Snell Jr. playing well right now, and Vandy’s Ke’Shawn Vaughn banged up, UK should handle this game at home. Evie: Vandy put a scare into a good Florida team last weekend. But with an 0-2 road record for the Commodores, and Kentucky sitting at 4-0 at home, the Wildcats will win this one at Kroger Field. Land: Vanderbilt isn’t an easy out anymore. QB Shurmur has been impressive and Vaughn has been a nice addition and Mason’s defense always can get stops, but Snell and Kentucky are just better. Wildcats get it done. Hays: Vanderbilt’s defense is going to key on Bennie Snell Jr. to force Terry Wilson is make some plays. Wilson makes enough to outlast Vanderbilt in the second half. Jake: Ole Miss surprises Auburn in a shootout in Oxford. Auburn is coming off of two straight losses and has struggled defensively. Stidham has been average at best, and Ta’amu is on his A-game right now, even without D.K. Metcalf. Ole Miss’ offense gained some confidence last week in a huge win at Arkansas, and should keep the momentum rolling with a win at home over an SEC team. Evie: Ole Miss’ come-from-behind victory over Arkansas was a sight to behold–and one that should give the players more confidence going forward. Auburn’s ground game is not what it used to be–the Tigers currently rank 11th in the conference, while, conversely, the Rebels’ Scottie Phillips is averaging 6.7 yards per carry. The Landshark defense took pride in stopping Arkansas when it needed to, and I think they’ll do the same against Auburn. Rebels win. Land: Ole Miss got the Arkansas monkey off their back last week, I want to think that Ole Miss can get the Auburn monkey off too, but I think Stidham finds some rhythm and Tigers overpower the Rebels. I’ve been wrong before, though. Hays: A struggling Auburn passing defense versus a high-flying Ole Miss passing attack could be a wild one. When Ta’amu throws for over 300 yards, the Rebels win. Ta’amu eclipses 300 with a late go-ahead touchdown. 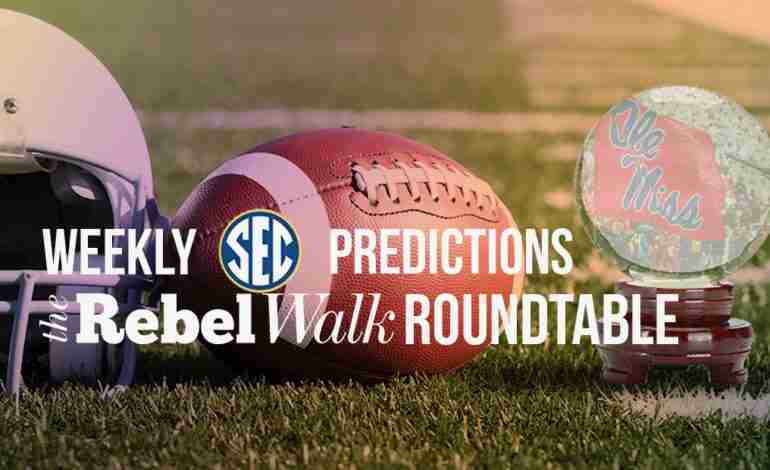 There you have it for The Rebel Walk Roundtable’s Week 8 SEC Picks! Let us know what you think will happen on Saturday, and start the conversation with us on Twitter (@TheRebelWalk) and Facebook!